Day 24 started in the biggest holiday park in the Southern hemisphere - Tahuna Beach Holiday Park. We were happy to see some blue skies. 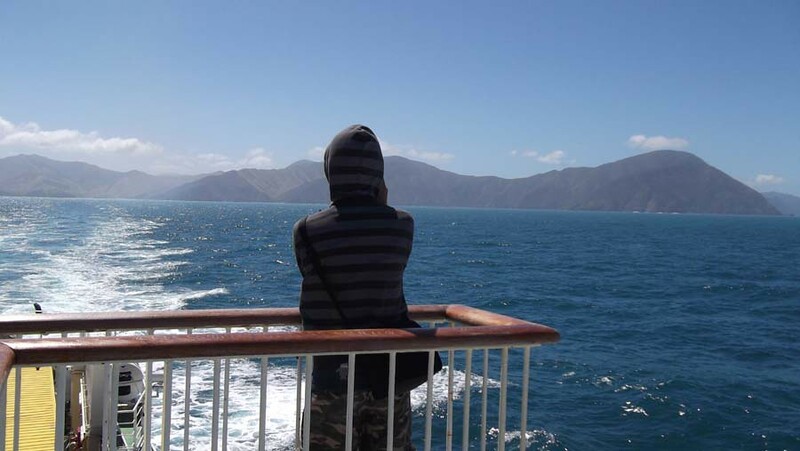 It looked like we were going to have perfect weather for our ferry crossing back to the North Island. Before we left the park, we talked to one of the managers. She said they have around 3000 people staying here over Christmas and she also raved about Nelson’s weather both in summer and in winter. Just before Christmas we were shut off on three sides. We had one night of rain and we all moaned and groaned about the rain, but Canvastown, between here and Blenheim, the road shut for three days. Murchison was under water and Golden Bay was, I mean they lost like 200 cattle or something and that’s all around us, but we’re in this wee V I guess and the weather comes up, splits and goes around us. So we have the most gorgeous weather. And in winter time there’s probably … I’d say the best time to come here. Because in winter time, we wake up in the morning, there’s a nice frost, there’s a blue sky, there’s no wind and all day … it just, it’s really beautiful. It’s a beautiful place in winter. 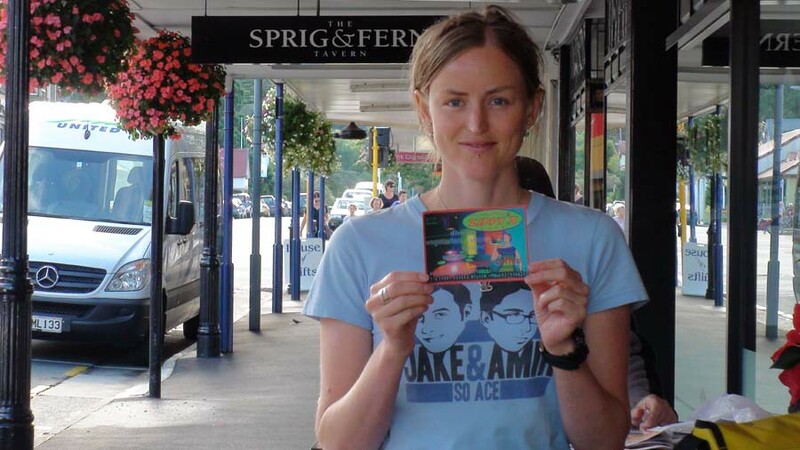 Ann said she has spent several months travelling around New Zealand and Australia in a campervan and I asked her if she had any advice. I’ve had one bad experience in Australia with a dodgy campervan company. You might think you’re going to save 20 bucks, don’t … don’t do it. Go with a reputable company and get a decent van. You know, cause at the end of the day, you’re not going to remember that you saved 20 bucks, you know, or that you paid 20 dollars more because it’s all part of your holiday, isn’t it? And it’s having something that’s nice, that works, doesn’t overheat and has service all around New Zealand is really important, I think. 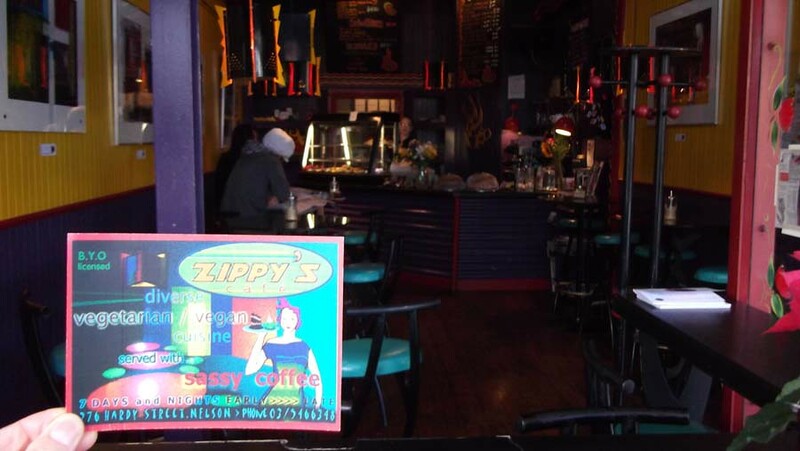 We went to a cafe in Nelson called Zippy’s. I came here more than ten years ago and I was happy to find it was still here. I had a coffee and a massive cookie. It was so good. The service was great too. I saw they had some postcards stuck to the till and I said I’d like to buy one. They said they didn’t have any for sale, but they took one of the till and gave it to me. I sent the postcard to the UK. And then we left Nelson and headed towards Picton to catch the ferry. We drove through a town called Havelock. Ernest Rutherford went to school here. In Picton, we had a picnic with my aunty and her partner and my cousin ... and this friendly duck. We took the 2:25pm ferry. It was a different ship to the one we came over on. This one was called Arahura. It was made in Denmark in 1983 and carries 550 passengers. On behalf of the captain and crew, we trust you’ve enjoyed your voyage with Interislander today and look forward to you sailing with us again soon. That night we stayed at the Wellington Waterfront Motorhome Park. It was really easy to find - we just followed the campervan signs from the ferry. This is a new park that opened at the start of last year. 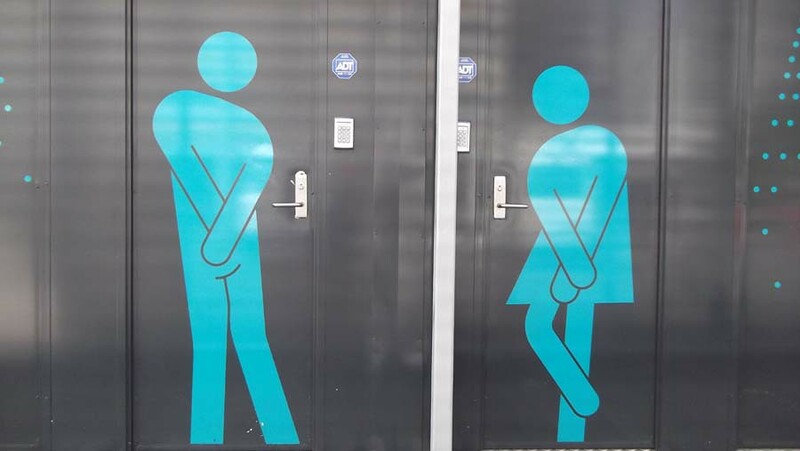 I love the pictures on the toilet doors. The location is very handy - right in the middle of town. It’s great for exploring the city but it’s not quite as peaceful as camping by the beach or in a rainforest.